The Republican National Convention was supposed to boost Cleveland. It probably won’t. The city has poured civic energy and hundreds of millions of dollars into the event. It’s unlikely to get much back. 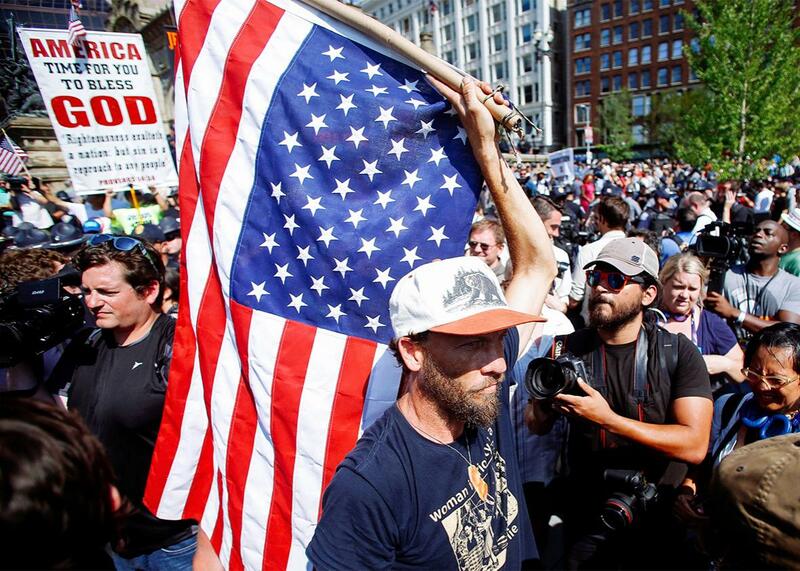 A protester against Republican candidate Donald Trump carries an American flag in the Public Square near the Republican National Convention in Cleveland on Tuesday. CLEVELAND—After Thursday, the Republican National Convention will be over. Cleveland will still be Cleveland. The convention and its needs have been Cleveland’s primary focus, rallying cry, and marketing ploy for the past two years. The long decline of manufacturing and the gut punch of the Great Recession, and the foreclosure crisis, have left northeast Ohio scrabbling for anything resembling economic uplift. While the city has a legacy of effective neighborhood-level community development, Cleveland’s population, economic prowess, and housing market are recovering unevenly, leaving many pockets in the city behind. Civic leaders have sold the RNC as a magic wand to correct the city’s ills—or at least bring a significant influx of cash. There are good reasons to doubt them on both counts. Cleveland bid to host the Democratic and Republican conventions (after losing the latter in 2008), and beat out Dallas for the RNC on the strength of its purported downtown renaissance, the promise of hotel construction, and a commitment to fundraising. (That $55 million to $60 million commitment turned out to be harder to fulfill than expected.) “Republican officials said the committee’s choice was unanimous, crediting Cleveland boosters’ enthusiasm in attracting the convention, as well as the city’s convention facilities and flexibility on potential dates,” reported the Plain Dealer after the selection in 2014. Cleveland has pursued a number of megaprojects in recent years, and the RNC might be the biggest one. In fact, it’s the culmination of a number of efforts that are super-sized on their own: construction projects ($272 million for a brand new hotel, two additional hotel renovations, a $19 million parking garage rehabilitation, and the $50 million renovation of Cleveland’s downtown Public Square); RNC event logistics ($50 million in security, one closed bridge to downtown); and plenty of local drama, like Case Western Reserve University’s displacement of summer students in order to house police during the RNC instead. All this formed the stage upon which the most bonkers political convention in recent memory has taken place. For Cleveland’s leaders, that stage is also one way to show off a new Cleveland to the rest of the country. “I think, in many ways, getting the RNC convention could not have come at a better time,” David Gilbert, president and CEO of the Greater Cleveland Sports Commission and Destination Cleveland, who also served as the RNC host committee chair, said in 2015. “Four years ago, we weren’t ready for prime time, and four years from now, the ability to showcase our comeback at its peak would have already passed.” Gilbert also emphasized that the “true effect of having this convention should be seen over the next three, five, and even 10 years.” Even in the face of heightened security concerns immediately before the convention’s start, Mayor Frank Jackson was still “chomping at the bit” for it to get going. While Cleveland is getting plenty of airtime, the economic benefits may prove more elusive. The city has thrown around $200 million as the return-on-investment benefit of hosting the RNC; that number isn’t based on any new calculation but rather the amount of direct spending that resulted from the 2012 RNC in Tampa, Florida. But that’s unlikely to materialize for Cleveland given the substantial pullout of donors, corporations, and delegates in response to Donald Trump’s ascent. The RNC host committee has commissioned Cleveland State University to study the convention’s economic impact, though figures won’t come out until the fall. But looking around, the promised economic boost isn’t looking very promising. Downtown has milled with foot traffic, but many bars and restaurants have been rented out to media outlets, making them impenetrable to locals. Others are emptier than they would likely be on any given weeknight, perhaps because of the enduring perception that it’s harder to get around the city given the influx of RNC visitors. While fences and jersey barriers make it a bit difficult to navigate the streets, there’s been no sudden crush on the streets or public transit. Businesses did encourage employees to work remotely this week, and some residents, myself included, took the week off. The relative calm suggests that those huge projections of a local windfall—again, based on the $214 million in direct spending and a $363 million increase in taxable sales in Tampa following the 2012 RNC—may not come to fruition. The most positive upshot would be what the 2016 host committee has described like this: “The lasting impact of hosting this convention far exceeds the immediate economic impact. Long after the last delegate departs, our region will benefit from an exposure multiplier due to the millions of potential investors, residents and visitors who will get to see and experience our city.” This is a remarkably intangible metric—and, again, one that’s not likely to materialize in a discrete way. Most reasonable people realize that megaprojects are not silver bullets: At this point, the only folks still touting the RNC’s potential to pump cash into Cleveland’s economy are the elected officials and local GOP leaders who have to stand up for the thing no matter what. That’s great, because once the delegates, reporters, protestors, open-carry clowns, and spectators depart, Cleveland has the opportunity to focus on itself, not the convention,for the first time in nearly two years. Journalists have started to pick up on the chasm between the RNC and what’s going on elsewhere in Cleveland and northeast Ohio. Downtown is gleaming spectacularly while neighborhoods like Slavic Village, Central, Kinsman, Hough, and Glenville are still struggling with deeply entrenched poverty. This dichotomy seems plainly obvious, but it’s still painful, and the inequality it engenders has real, serious impacts on public health, economic vitality, and job access. Two upcoming megaprojects include a new downtown courthouse and jail, and the Opportunity Corridor: a 3.5-mile, $331 million boulevard that will essentially make it much easier for Cleveland Clinic staffers to bypass some of the city’s poorest, blackest neighborhoods. This is to say nothing of the region’s transportation woes. The Fixers, a local “collaborative public art project” that has resulted in a series of short films, meditates on Cleveland’s two faces, imagining locals as fixers for foreign journalists attempting to answer, “What will delegates and journalists be missing if they stay within Cleveland’s tourist districts? What could the rest of Cleveland tell political decision-makers about how public policy is impacting urban Americans?” The Fixers films, which focus on transportation, policing, reproductive health, nutrition, and community organizing, are gorgeous and poignant, and through their narratives indirectly condemn the city’s top-down, slavish devotion to accommodating the convention and its attendees. Clevelanders shown in The Fixers have been left to plug the holes where government won’t, which seems especially cruel given the favors granted to the RNC. Because ultimately, the RNC is the centerpiece of no plan. It exists in a vacuum. The city and the host committee planned a party, and it’s not worth pretending otherwise. Without the RNC, Cleveland might have had fewer hotels, fewer summertime visitors, fewer BuzzFeed parties, and definitely no restaurants rented out to Twitter. But the macro trend of millennials and boomers pushing up demand in now-shiny urban cores would have thrummed in Cleveland’s background regardless of it being the convention’s stage. Residential and mixed-use developments will still come online in the next few years and will still contrast painfully with necessarily small-scale efforts to pull up the value of long-neglected, isolated neighborhoods. Barring a major turnover of elected officials at all levels, Ohio will continue to fiscally starve cities: The Plain Dealer found that “more than 70 cities are down at least $1 million a year because of budgeting and tax decisions made since [Gov. John] Kasich he took office in 2011.” With no support from the state, Cleveland is left to cash in on the nationwide demand for walkable neighborhoods.